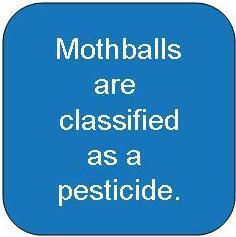 Mothballs often contain a chemical called para-dichlorobenzene. According to the US Environmental Protection Agency, this chemical can cause headaches, swollen eyes, loss of appetite, nose and throat irritations and even cancer. When you inhale and are able to smell that "mothball odor", you are actually inhaling small amounts of the chemical. Additionally, mothballs pose a poison risk if you have small children in the house.